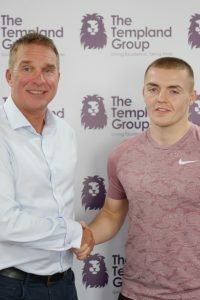 A Sheffield-based boxing champion can now “focus 100% on his preparations for professional titles,” thanks to sponsorship from The Templand Group and other backers. 23 year-old Callum Beardow has won seven Yorkshire titles during his amateur career, a silver ABA medal, an English Cruiserweight title belt and is ranked 2nd in the country in the English cruiserweight table. Beardow now has his sights set on an English professional title and hopes to progress to British, European, Commonwealth and World belts. “My co-director Steve Clarke and I are delighted to be involved at such an early stage of Callum’s professional career. His development through the amateur ranks had not gone unnoticed by many connected within the fight game and we were incredibly happy to see that he had signed his first professional contract with the impressive Dave Coldwell and his team. “For any athlete to become proficient within their chosen sport, there has to be an element of ongoing financial support and we are pleased to be associated with a number of Sheffield businesses who value this opportunity to sponsor this talented young man, with the hope he can follow in the footsteps of some of Sheffield’s finest boxers who made to the top of the world stage.